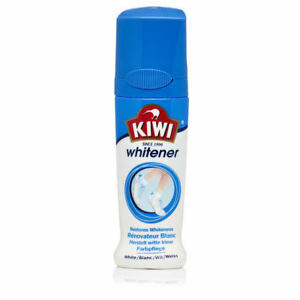 Freshen up all your white shoes, whether golf shoes, trainers, tennis shoes, gym shoes, or fashionable holiday footwear, with Kiwi Sports Leather Canvas Whitener Cleaner. Supplied in a handy 75ml size, this shoe whitener cleans and protects all white sports shoes and is suitable for footwear made from canvas fabric, nylon, and smooth leather. Ingredients include a high proportion of polymers and pigments for excellent coverage and easy application.